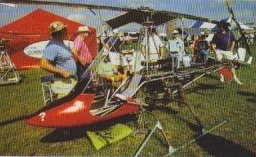 A single-seat open-frame helicopter, Doug Schwochert's adaptation of the Adams-Wilson design included a re-designed main and tailrotor-swash plate and main frame. Plans include over 100 pages of CAD drawings and photos. The rotor blades are from A-B Helicopter, and are all aluminum extruded spar with full length aluminum skins bonded and riveted. The A/W 95 features of true helicopter vertical take-off & landing, and forward, backward, sideward & hover flight, with standard helicopter-type control system. Improvements on the original Adams-Wilson design include a higher power-to-weight engine, improved, more durable swash plate and tail rotor system and updated airframe design. 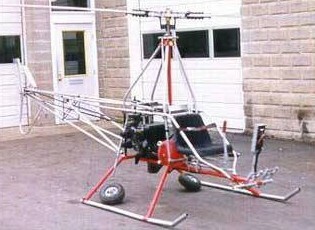 Now powered by a Rotax 503, the drive of the rear rotor has been redesigned and the rotor head reinforced to take extruded dural blades.